To welcome spring, I created a stylish cross-body bag that works for everything from browsing the farmer’s market to dancing the night away at a music festival. This cotton bag features a trendy geometric pattern in soft pastel hues in a size that is perfect for holding essentials. 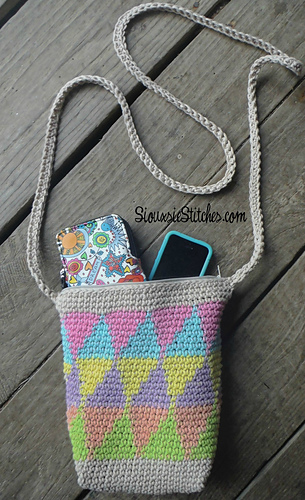 This bag is created using tapestry crochet in-the-round and incorporates a couple of really neat construction methods that I found through Pinterest, so this is a great project to try if you want to learn some new techniques.